These heavy-duty welded steel files will provide long lasting durability to keep your valuable blueprints, drawings, artwork, maps and other flat materials neatly and safely stored. 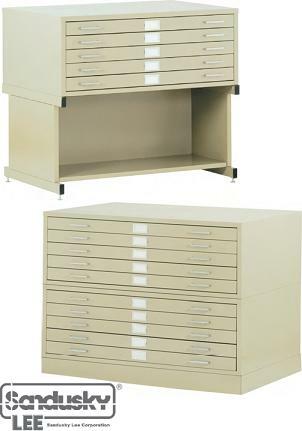 Includes hinged paper weights in drawer fronts and hoods at rear to keep papers from curling. Drawers slide smoothly on ball bearing rollers for trouble-free operation. 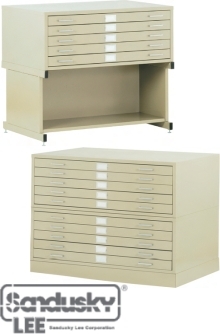 Stack files on optional 6" high closed base (when stacking two high) or on 20" high open base (when using single 5-drawer flat file) which includes a lower shelf for extra storage. Available in several colors.